The summer season is fast approaching and you know what needs to be done to keep your lawn green and healthy. A proper watering schedule is essential. That is why a water sprinkler system can be such an asset for a homeowner. Regular lawn mowing is also a vital part of keeping your lawn looking its best. That’s why it’s so important to make sure your mower will keep running strong throughout the summer. Clean your mower often but don’t use water any more than you have to. Water can lead to corrosion. Instead, use compressed air when possible. If you do use water, make sure to grease and lubricate afterword. Fresh gasoline is a lawnmower’s friend. It helps maintain an engine’s performance. 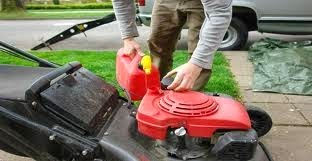 If you keep gas in a metal can, consider using a clean funnel to transfer gas from the can to the mower. Also try to keep track as to when you bought the gas. Gasoline that’s older than 30 days can be impacted by moisture buildup and octane loss. These things can lead to gum deposits in the engine’s fuel lines and carburetor, causing poor engine performance. This is a must at the beginning of the spring and it’s a good idea to check it again during the summer. The spark plug should be replaced after every 100 hours of operation. Check the owner’s manual to determine the spark plug type and gap. Blades may start to dull during the season. A sharp blade means a cleaner cut, making for a healthier lawn. Blades can be sharpened with a file or on a grinder wheel. Never attempt to sharpen the blade while it is still on the mower. If you are unsure about properly sharpening a blade, don’t guess. Check with a lawn mower maintenance professional.